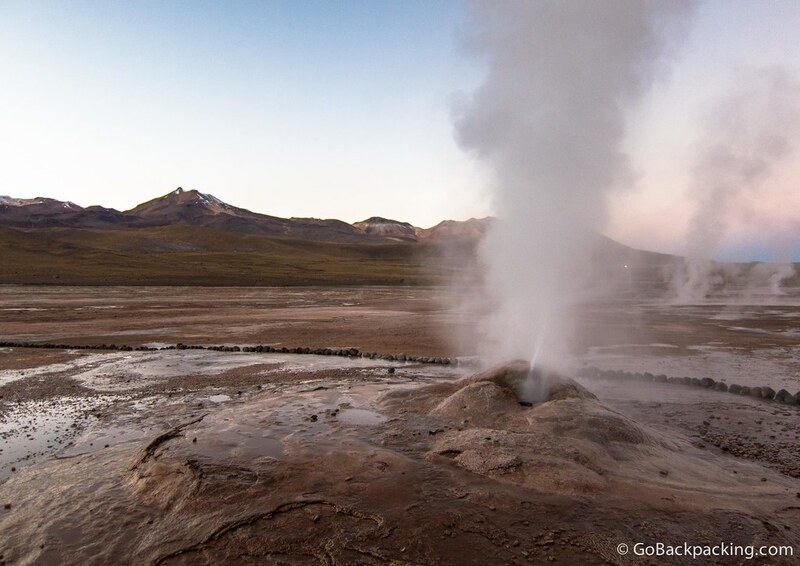 At an altitude of 4,300 meters (14,100 feet), it is also one of the highest geyser fields in the world. 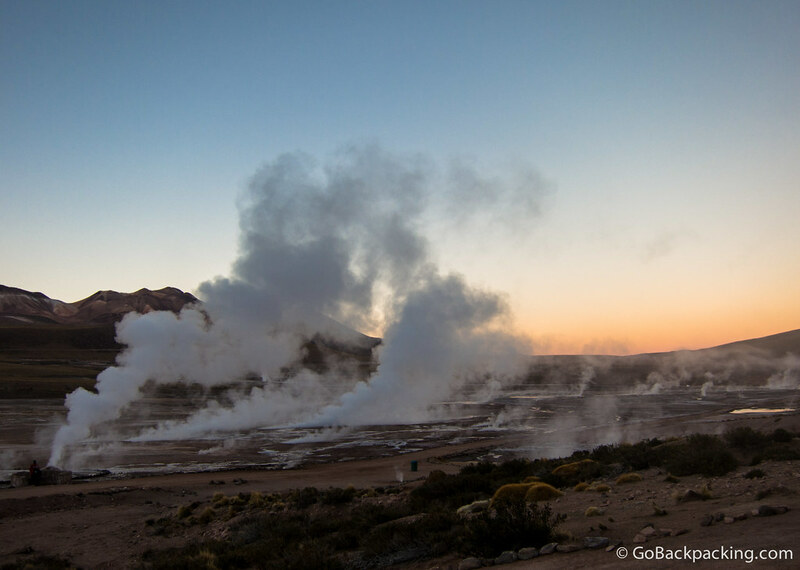 Getting there from San Pedro de Atacama is easy, if you're willing to accept a 4 AM departure. 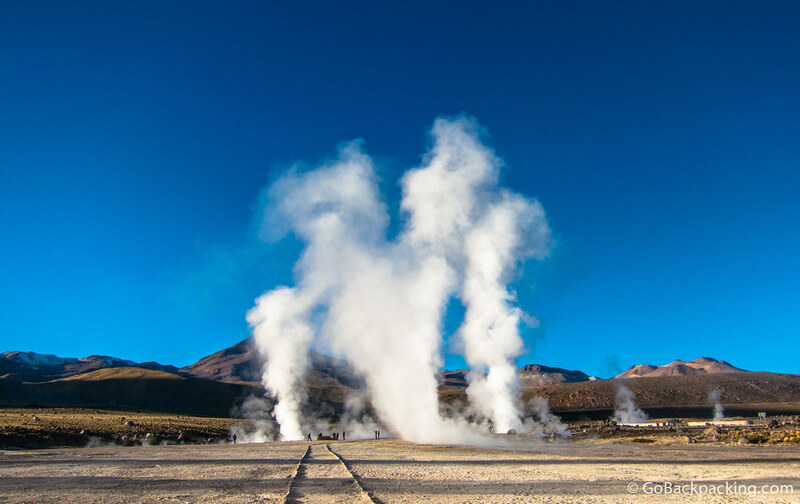 The Tatio geysers are most active around sunrise, therefore tour vans leave San Pedro super early in order to arrive at Parque Geotermico Geyser del Tatio, near the Bolivian border, by 7 AM. It's only 90km away, but the roads are bad, and the vans are driving in the pitch black. 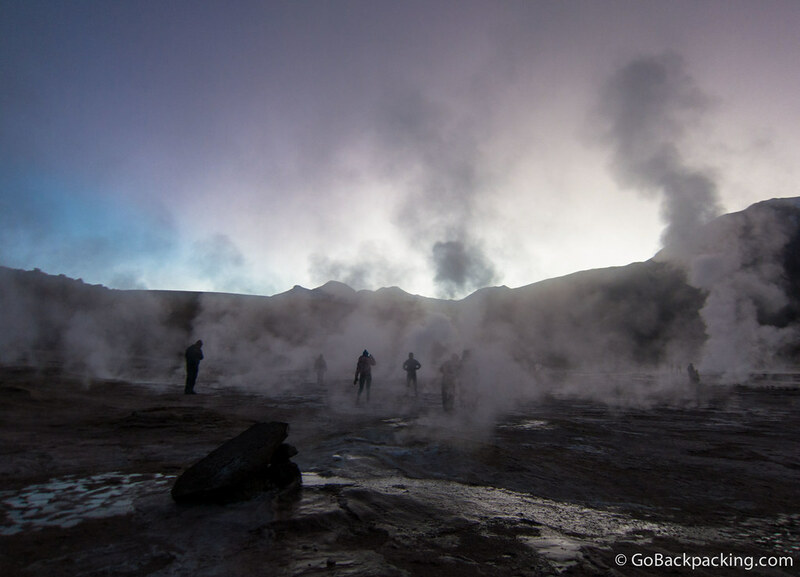 Despite being in the desert, the lack of sunlight, combined with the high altitude ensure freezing cold temperatures. 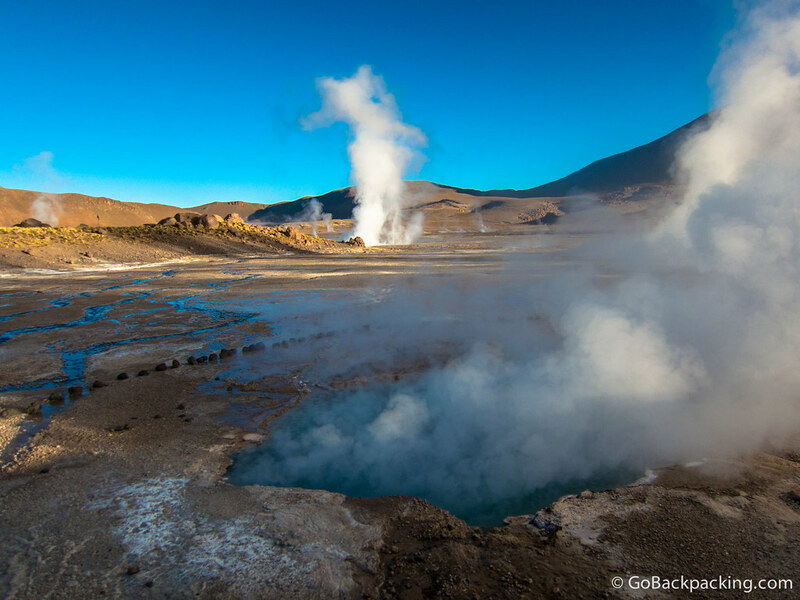 Seriously, when you first arrive, you'll be standing around in the frigid cold, barely able to see anything until the sun begins to rise. Dress warmly, but in layers, as you'll want to peel a few off by midday, as your tour makes its way back to San Pedro. I paid $29 for the tour, which included guide, transportation, and a light breakfast. In addition, there was a $10 park entrance fee. 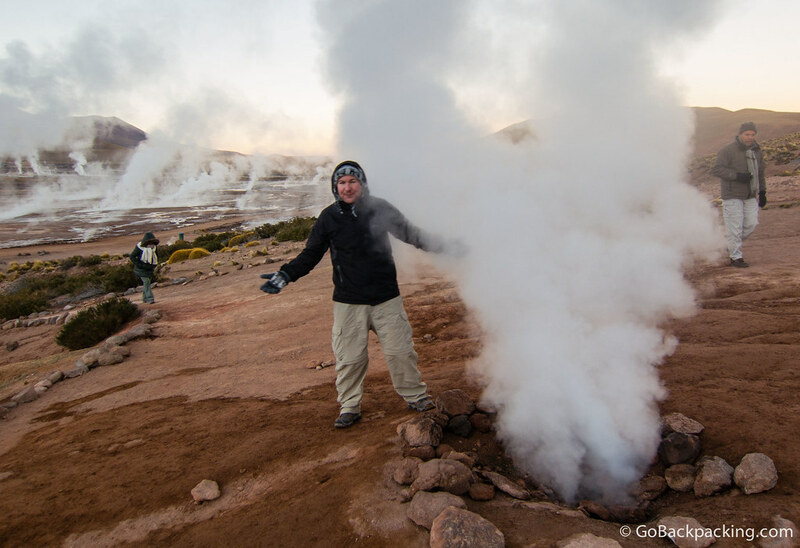 Tourists are advised to keep their distance from the geysers, as the crust around them can be thin. 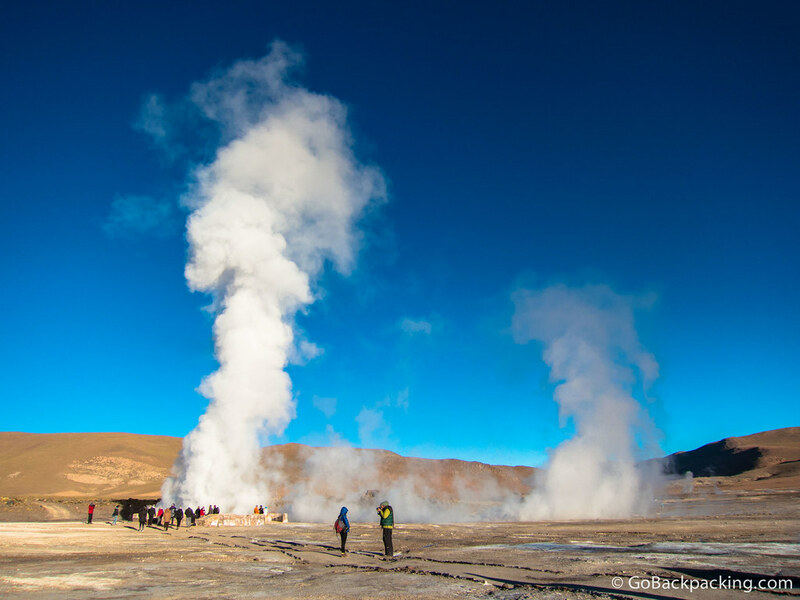 Our guide warned us that more than one person had been injured and killed over the years, as a result of falling into the boiling water. 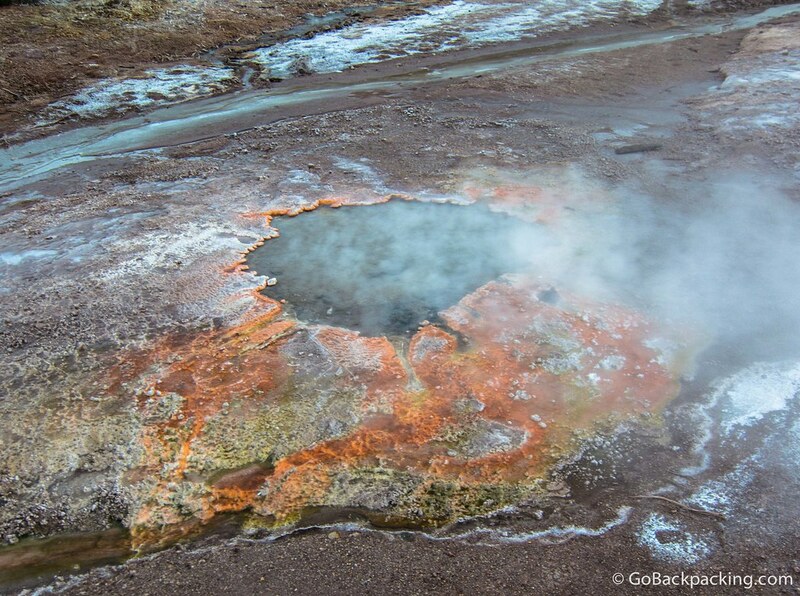 The geysers are natural vents for magma that heats up an underground water source. 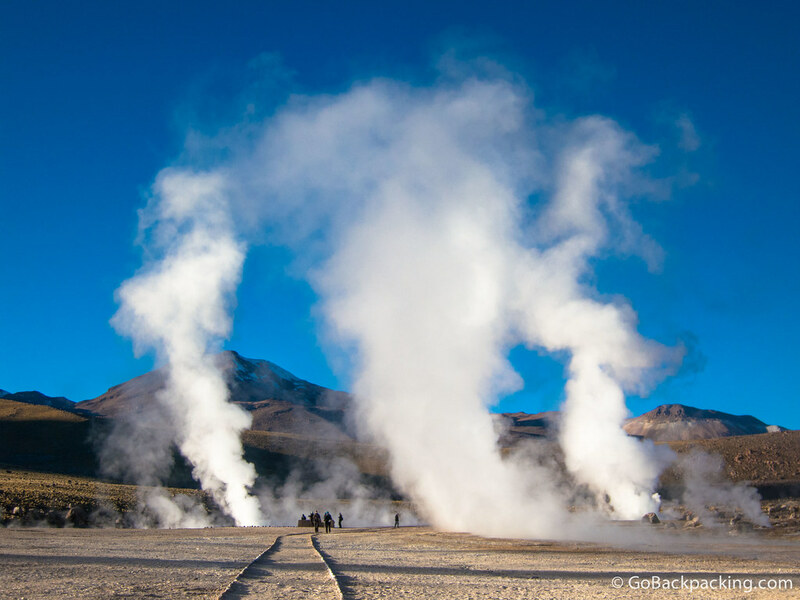 The steam is released at 85 degrees Celsius, or 185 degrees Fahrenheit. 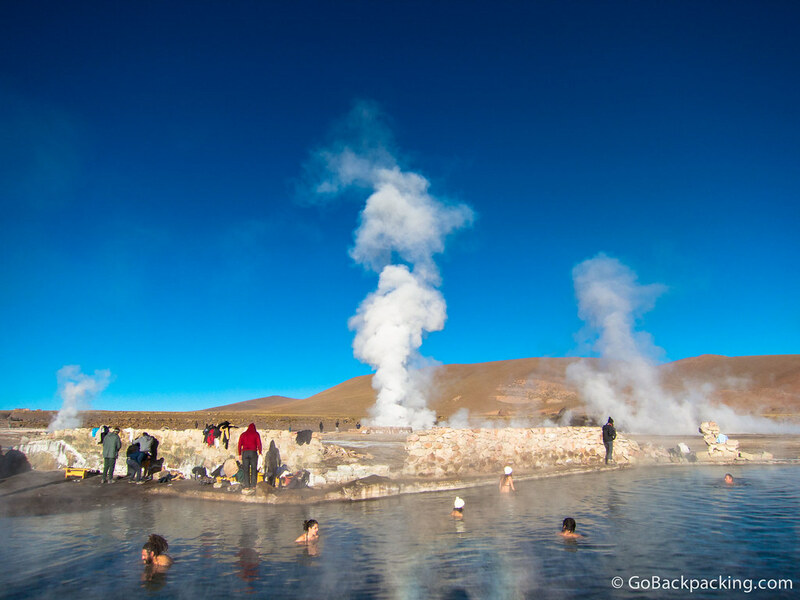 An optional dip in a natural hot spring is a popular activity. There are no changing rooms, so plan ahead, or prepare to bare your bottom. very beautiful pics even i can gaze them for hours. please let me know your suggestions by plain vs bus? Hi Ben, I traveled to San Pedro by plane from Santiago. I’m not familiar with Rio Gallegos in Argentina. Why was the departure at 4 am? Just to catch the sunrise? Can’t you go by yourself? The 4am departure was to catch the sunrise. We drove most of the way in the pitch dark, with just the headlights to light the way. If you have your own 4×4, maybe you could do it alone, but I would plan to go with a group. To be honest, I can’t remember if the road was paved the whole way. You can ask around once you’re in San Pedro to get better advice. Hi, love this post. 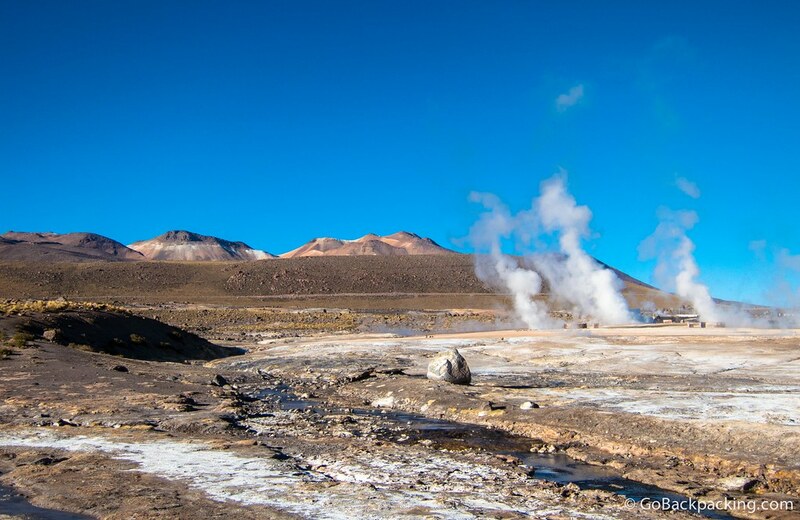 I hope you don’t mind I’ve added the link and a few lines to my post: STEP 294 – See the El Tatio Geysers and Atacama Desert, Chile. Hope to send some more page views your way. 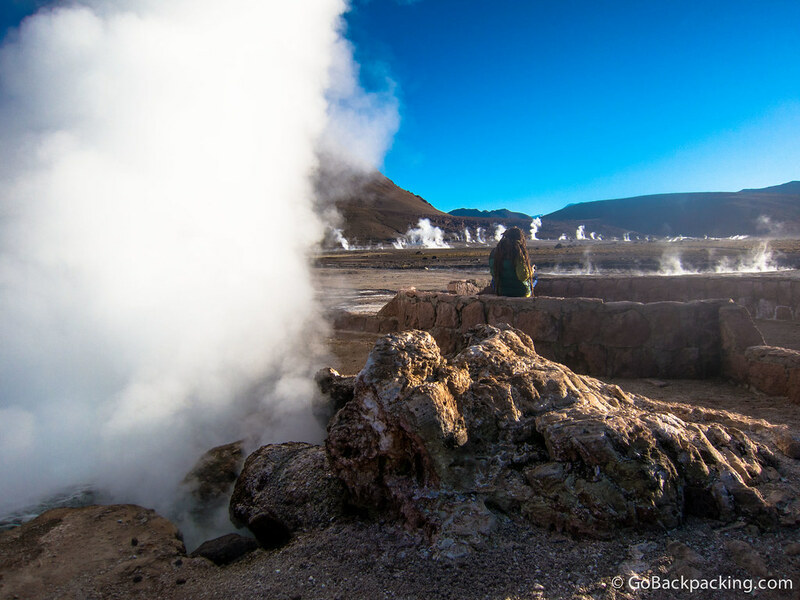 We’d love you to share your story from your visit by joining our STEPS challenge. 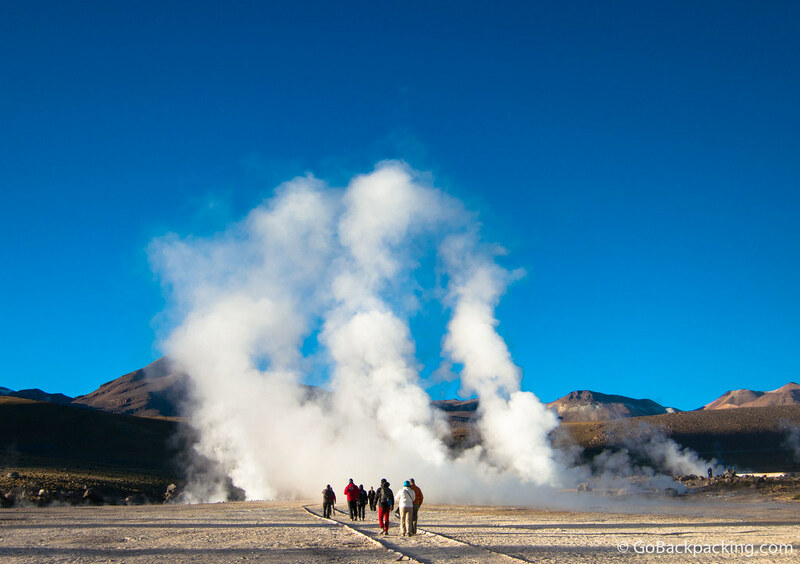 You might even make our Top 100 travellers list. Hi Si, thanks for the link.